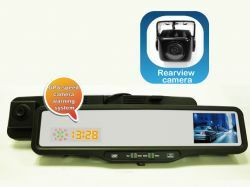 ABEO HDVR-200A is a wide angle rear view mirror with HD high definition DVR module. The lens can be adjusted to accommodate with different drivers. DVR module has high quality image sensor and lens to record image on SD card while driving. Furthermore, there is no gap between file clips so no details will be missing. ABEO HDVR-200C is a wide angle rear view mirror with HD DVR module in the front and VGA DVR module to capture image behind the vehicle at the same time. It can also get connected to the backup camera. DVR module has high quality image sensor and lens to record image on SD card while driving. Furthermore, there is no gap between file clips so no details will be missing. GPS radar detector will remind drivers of road speed limit such that the riskof receiving tickets will be reduced.